As a child growing up, slathering pesto on my pasta, much less anything else (such as a sandwich) wasn’t my idea of a good time. I guess for me, I was more the traditionalist when it came to spaghetti or fettucine, preferring a delicious, fresh garlicky marinara. It wasn’t until college on a trip to Italy with a good friend of mine that I realized pesto in jars tastes nothing like the real thing. Sitting in a tiny seaside restaurant in the Cinque Terre region of Italy I tasted pesto for REAL. Bursting with fresh green basil, toasted pine nuts, amazing olive oil and pungent parmagiano it was pure heaven. Served simply with a freshly homemade tagliatelle it was music in my mouth. Pesto is so simple, and could even seem basic to some (ingredient-wise). But with the best ingredients, a simple recipe can taste absolutely amazing. Now that I’m older, I do love me a good pesto. Basil is hands down my favorite herb to cook with. For me, there is no other smell like it and it instantly gets my mouth watering. I keep a huge pot of it in my kitchen in the winter and once the hot weather hits, I set it outside to bask in the sun. Basil always reminds me of summer and this super simple pesto recipe makes perfect use of it. I decided to serve this pesto with shrimp that I marinated in meyer lemon olive oil, juice of one lemon, couple cloves of crushed garlic, grated rind of one lemon, fresh chopped basil, chili flakes, sea salt and pepper. I kind of eye-balled the olive oil. You don’t want to douse it, just enough to cover everything. Once you’ve mixed everything, add in your shrimp. 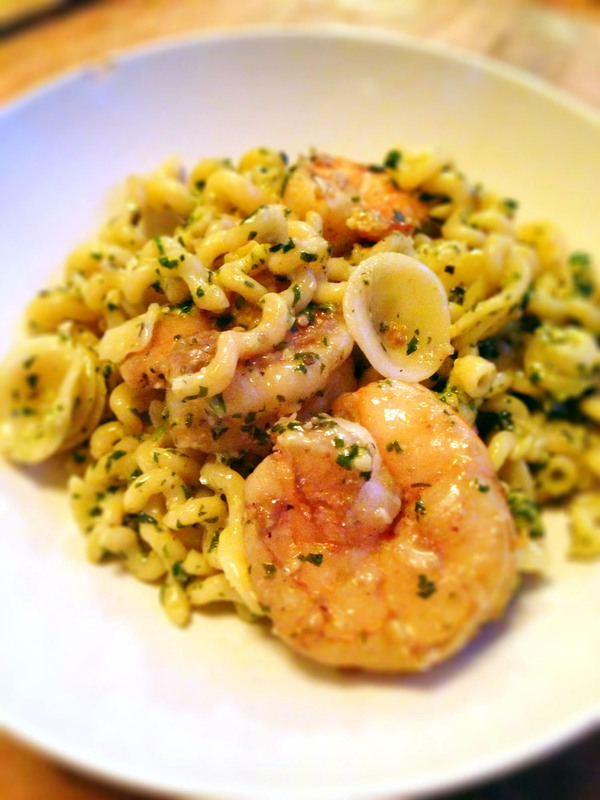 I often use Trader Joe’s Wild Blue Shrimp in the freezer section, they are super tasty and easy to pull out for a quick dinner. Yum! I let these marinate for about an hour, but you could go longer if you have the time. 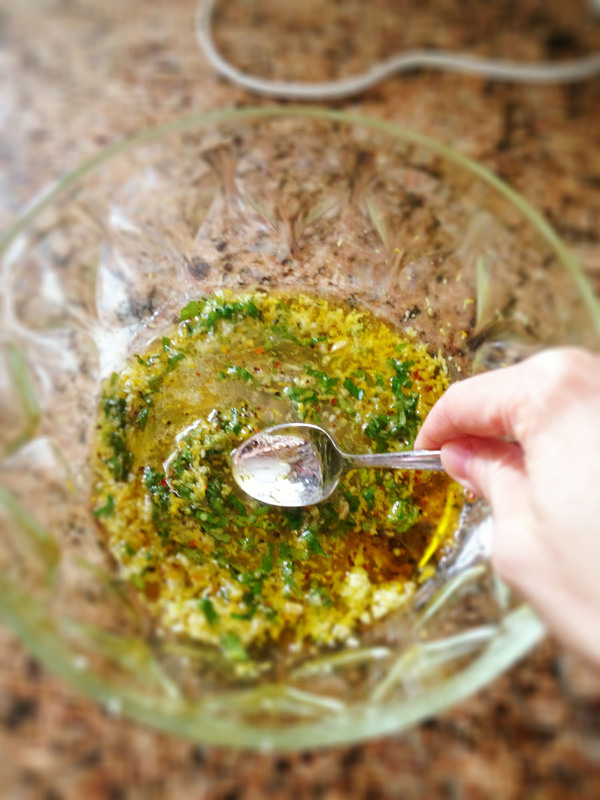 While everything is marinating it’s time to get working on your pesto! 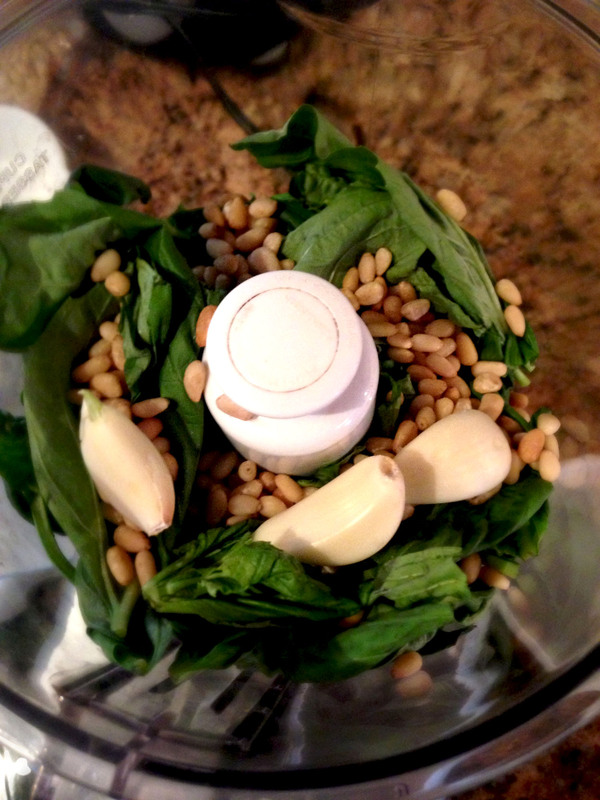 Once you have all your ingredients together, throw your basil leaves, pine nuts and garlic into your food processor. Pulse lightly and start incorporating your olive oil slowly. I would start with half the quantity and see how things are looking and then slowly add more from there to your desired consistency. Next add the cheese, salt, pepper, and zest of one lemon. Pulse as much or as little depending on how chunky you want your pesto to be. That’s it! Pesto is done. Cover and leave for a little to let the flavors meld. 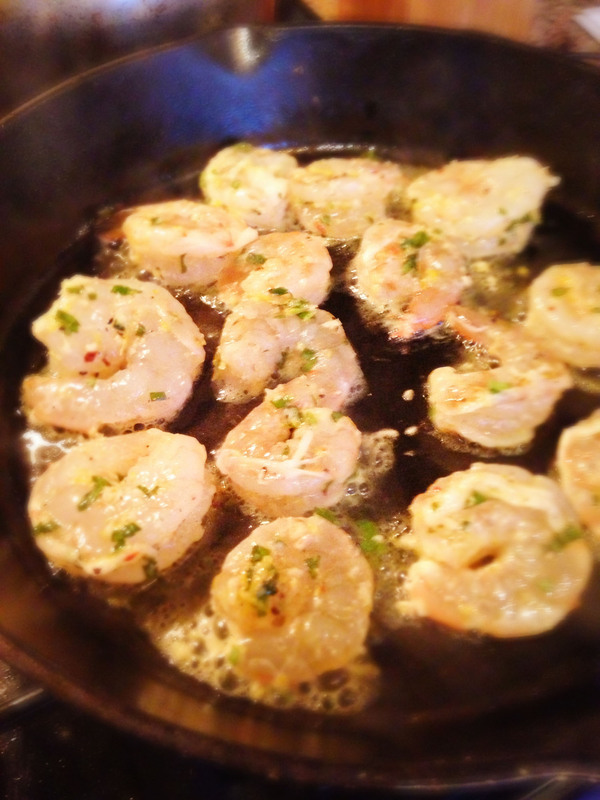 While the pasta is cooking, cook your shrimp. I sauteed mine using a large cast iron pan. I love cooking in cast iron! Once the shrimp and pasta are done, it’s time to throw everything together. TIP: Reserve about a cup of water from your pasta cooking pot prior to straining your pasta. This is added to the mixture to really incorporate everything together. Toss your pasta, pesto and 1/2 cup of water together in a large bowl. Adjust if more water or salt/pepper are needed. 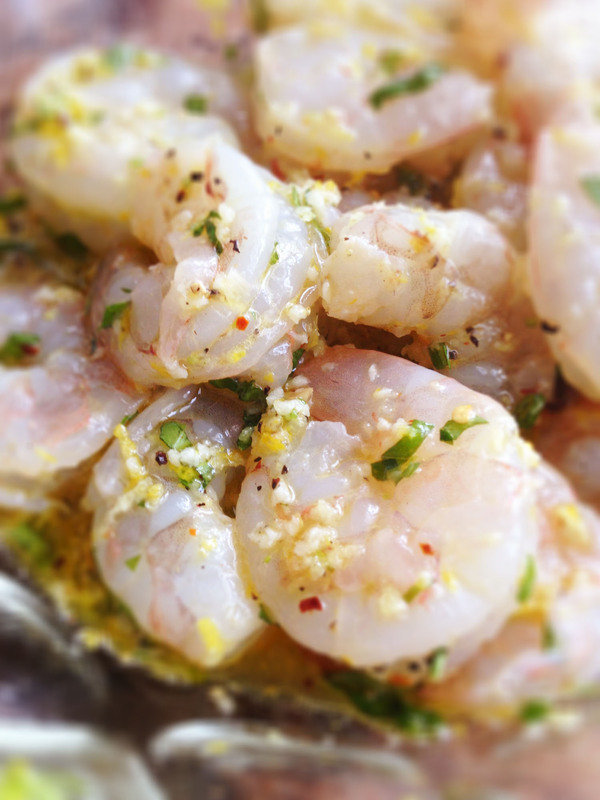 Once fully mixed together, add your shrimp and you are ready to eat! Doesn’t that look delicious? 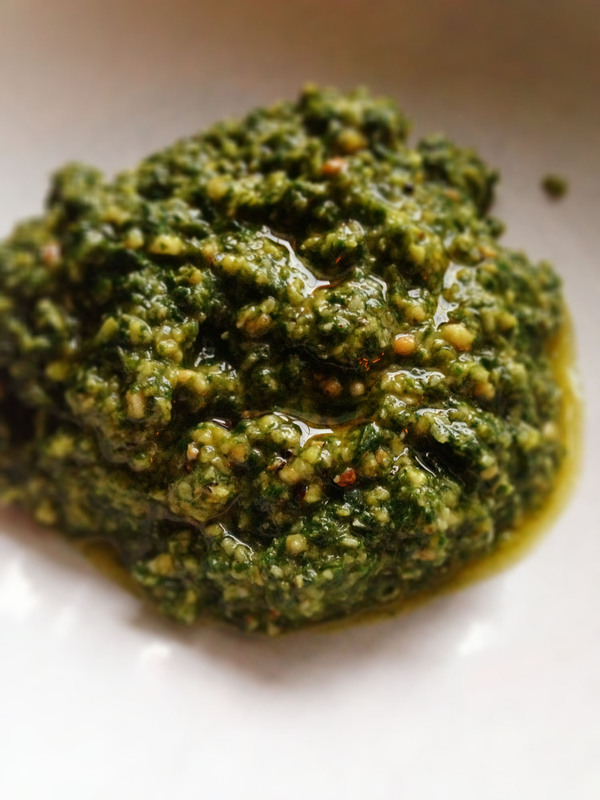 The flavor of fresh pesto is light, flavorful and so fresh testing. It beats the canned version every time. And lucky for you, it’s super easy to make. So enjoy this taste of summer and happy cooking! Next DIY Juicing 101 & My First Video!